My entire adult life has been coincidental with rise to dominance of the economic dogma of “supplied side” economics. The United States now has 35 continuous years of experience with implementing a theory that cutting taxes for the very wealthy is the primary key to achieving sustained economic growth. We now have sufficient results of that experiment to demonstrate it has failed to achieve any of its promises. Instead of boosting long term growth, the non-stop pandering to the selfish impulses of the rich has contributed to the long-term economic decline of the U.S. while increasing short-term volatility in the economy. The dotted red line, which is the long term trend, is negative. 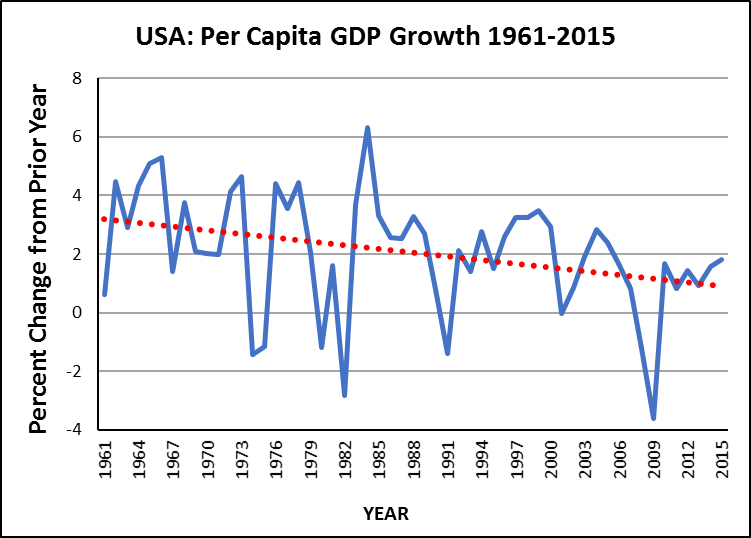 Gradually, per capita GDP growth in the U.S. is getting smaller and smaller, and the Reagan and George W. Bush tax cuts did nothing to reverse the decline. 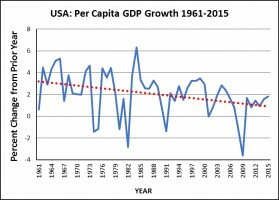 The rapid increases in per capita GDP growth immediately following the Reagan and Bush tax cuts were short lived; within a few years, each was followed by recession. The closest the U.S. has come to the “unfettered capitalism” celebrated by supplied side economics was during the early years of the Bush Administration. The primary accomplishment there was the worst recession since World War II and an outright catastrophe in the housing market. The bottom line is, from 1981 to the present, Federal taxation policy resulted in an astounding reduction in the tax burden on the wealthy while the country’s overall economic condition continued to decline. If this was just about making the rich richer, then mission accomplished. At this juncture, with the uncertain prospect of a “major tax overhaul” looming in Congress, I want to argue for a different direction. American policymakers need to recognize that the verdict is in on supplied economics, and it has failed to produce reliable, continuous economic growth. I am not an economist by training but I am a pragmatist by experience. We gave it a go, it didn’t work, let’s move on. Only a fool keeps a grip on the Titanic as it slips beneath the waves. In its original formulation, Keynesian fiscal policy argued that government spending should be counter cyclical, increasing in times of recession and then decreasing during recoveries. What also is evident is that a counter cyclical approach helped to increase economic volatility, encouraging a “boom and bust” business cycle since 1961. Supplied side economics definitely accentuated that cycle. Such volatility has become a preeminent concern that must be managed by Federal fiscal and tax policy moving forward. Amplifying the volatility is the increasing computer automation of trading in financial markets as investors seek opportunities to exploit brief delays in how markets react to real time events. What Federal policymakers must accept is that economic growth requires robust Federal spending paid for by a progressive taxation system. Federal spending should be a large enough share of the overall economy to reduce economic uncertainty and mitigate swings in the financial markets. Much of that spending should be directed at maintaining consumer demand for everyday products and services including food, health care, education, energy and transportation (big ticket military spending is not going to cut it). I don’t know if the bottom 50 percent of the income distribution is the correct group to target, or if the target should be the 75 percent, but fiscal and tax policies must benefit most consumers. Some of the revenue necessary to achieve this can be brought in simply by enforcing the existing tax code (something like $400 billion in taxes are not collected every year). But there are many excellent reasons to increase taxation of the wealthy to support a smoother, stronger overall economy. In addition to paying a fair share of the, “cost of doing business,” other reasons include the need to slowly but surely retire the national debt (we are not going to do that by cutting taxes), and contribute to the longer term viability of Social Security and Medicare. I believe that the change in fiscal and tax policy outlined in this article are inevitable. It seems likely that Federal policymakers will try to avoid the inevitable and thus push the U.S. the brink of another serious economic crisis. One way or the other, after having exhausted the alternatives, a more sensible and evidence based approach to taxing and spending will prevail. At that point the appropriate place of the federal government as custodian of economic success for the country as a whole will be restored, and the prior 35 years of misguided policies to the contrary may be relegated to the history books where they belong. This is a very unfortunate article. To draw such conclusions requires deeper economic analysis. This is political bias in action and below the level of content I signed up for.